PALO ALTO, Calif. — Though NASA's share of the federal budget has dropped dramatically since the space-race heyday of the 1960s, the United States still regards space exploration as a key priority, NASA's deputy chief says. The agency's allotted $17.7 billion budget represents less than 0.5 percent of federal spending for 2013. That's a nearly tenfold drop from the agency's peak share back in the mid-1960s, when the United States was racing to put an astronaut on the moon before the Soviet Union. But $17.7 billion is far from chump change, especially considering how much other nations spend on their space programs, said NASA deputy administrator Lori Garver. "If you total up every other space agency on the planet today — Russia, China, Japan, all of Europe, Canada, South America — they equal three-quarters of NASA's budget," Garver added. "So don't believe that America has turned its back on our civil space program." Policymakers may still value space exploration, but their vision of where NASA and its astronauts should go has changed over time. For example, the agency had been working on getting astronauts to the moon by 2020 as part of a program called Constellation, which began under President George W. Bush. But President Barack Obama cancelled Constellation in 2010, after an independent review panel found it to be significantly over budget and behind schedule. Instead, Obama directed NASA to send humans to a near-Earth asteroid by 2025, then on to the vicinity of Mars by the mid-2030s. The agency is developing a crew capsule called Orion and a huge rocket called the Space Launch System to make it all happen. NASA will fund these deep-space missions in part with resources freed up by the retirement of the space shuttle fleet, which was grounded in 2011 after 30 years of orbital service and more than $200 billion of investment. The agency is now grooming private American companies to take over the shuttle's role of ferrying cargo and crew to and from low-Earth orbit. NASA signed a $1.6 billion deal with California-based firm SpaceX for 12 unmanned cargo deliveries to the International Space Station, and it awarded a $1.9 billion contract to Virginia-based Orbital Sciences Corp. for eight such flights. SpaceX's robotic Dragon capsule flew its first contracted supply mission in October, and the second is slated to blast off next month. Orbital Sciences, meanwhile, aims to launch its Antares rocket and Cygnus capsule on a test flight to the station later this year. The Dragon capsule is also in the running to carry astronauts to and from the station for NASA, as are the CST-100 capsule and the Dream Chaser space plane, which are being developed by aerospace giant Boeing and Colorado-based Sierra Nevada Corp., respectively. 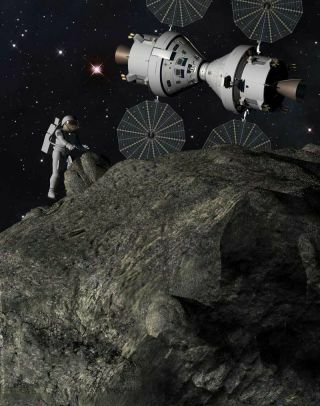 NASA hopes to have at least one of these vehicles up and running by 2017.